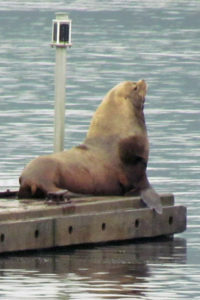 Each fall sea lions come into Cowichan Bay and haul out on the floating breakwater near the Government Dock. They come to feed on the coho salmon (Oncorhynchus kisutch) in the Bay which at that time are waiting to head up the Cowichan and Koksilah Rivers and the small streams around the bay to spawn. When sea lions are feeding in the Bay or the Estuary there is usually a flock of gulls around them hoping to get a few snacks. A big sea lion may eat as much as 16 kg (35 lb) of fish each day. Both California (Zalophus californianus) and Steller (Eumetophias jubatus) sea lions can be seen on the breakwater. The Steller sea lions roar and are light brown when dry. They can weigh up to one tonne ( 2,200 lb). 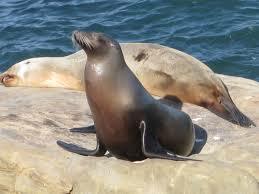 The California sea lions are darker in colour, smaller, up to 400 kg (900 lb), and bark rather than roar. They also have a rounded lump on their forehead. The sea lions usually arrive in October and depart between Christmas and New Year. It is usually only the male sea lions that come to the Bay. Harbour seals (Phoca vitulina richardsi), sometimes as many as 100, can be found year round in Cowichan Bay. They can be seen hauling out on the log booms. They cannot get on the breakwater where we see the sea lions as it is too high. 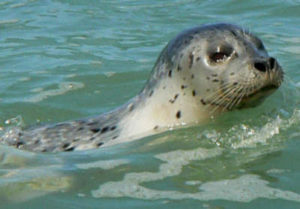 Harbour seals feed on a variety of fish and an individual seal may eat 5 to 7 kg (12-15 lb) of fish per day. Learn more about harbour seals here.